1. When does a dancer need a costume? 2. What costumes do beginners wear? annual recital and in competitions. 3. What is a class costume? 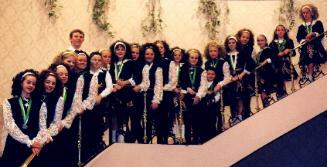 Each Irish dance school has a costume with a particular design and colour combination. 4. Where do dancers get a class costume? or speak to Sheila about having a new costume made for your dancer. We work very hard to keep this cost as low as possible.